Burn wood this winter, carbon neutral and cheaper than coal! Need help with Storm Damage? Cal now - 24h call out. Contact us today discuss your requirements in detail - for the quickest response call John on 07881 830 397. 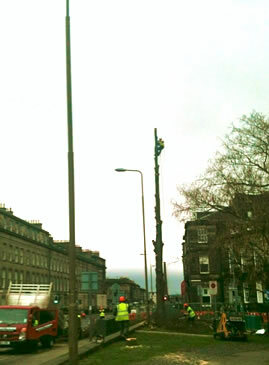 Fully insured - public liability up to £10 million. Fallhills Firewood are exprienced and great value tree surgeons. 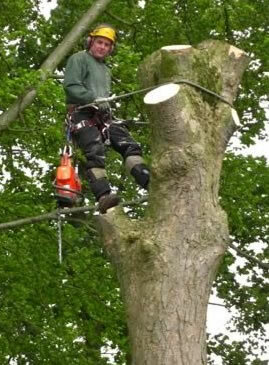 Fully qualified tree surgeons with years of experience handling difficult and challanging jobs. We deliver for free to the following areas in Edinburgh, Lothians, Midlothian, and parts of the Borders. Or come and collect, we would be delighted to see you! "Fallhills Firewood provided a professional, tidy job of removing trees in a sensitive area next to a garage and shed. They also put in a sturdy fence afterwards. The whole job was easy from a client perspective, and excellent value for money. If I needed more trees removing I wouldn't go anywhere else." "I wanted to send this quick note by way of thanks for a recent job we had carried out at our premises to remove a large Hawthorn tree. The job was carried out by two very pleasant and knowledgable professionals who quickly and efficiently felled and removed the tree. All mess associated with the job was cleaned up before completing the job. I would thoroughly recommend this company. Copyright 2011 - 2019 © Fallhills Firewood Ltd. All Rights Reserved. Site by tribalogic.